With current glass facades claiming the lives of hundreds of millions of birds each year, an innovative glass solution was urgently needed to address this dire reality. Innovative firms such as Walker Glass and Vitro are leading the charge in offering intelligent solutions that deter bird collisions and optimize energy performance and the passage of visible light into the building. Walker Glass and Vitro joined forces to create AviProtek® E, bird-friendly glass that combines acid-etched visual markers on surface 1 and Solarban® with high-performance low-E coatings on surface 2. The acid-etched surface mutes reflections, providing efficient visual markers for birds while having no impact on the level of visible light transmittance. Optimal energy performance is reached with Solarban® 60 and 70XL high-performance low-E coatings from Vitro. 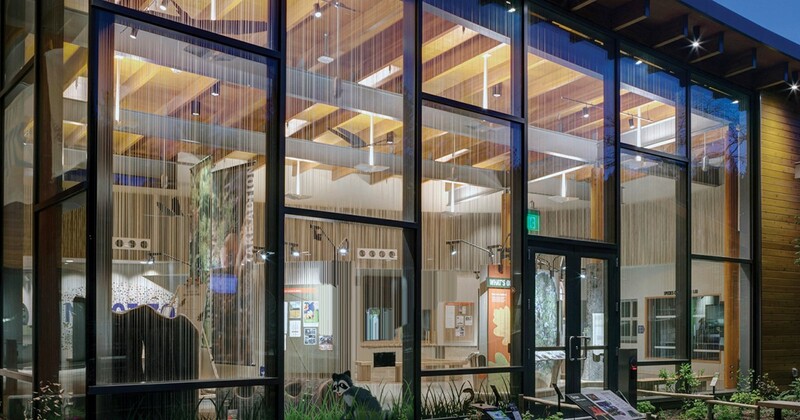 At the Oregon Zoo Education Center, designers used 6 mm clear glass with pattern 211 on surface 1 and Solarban 70XL on surface 2. With AviProtek® E, it is now possible to conserve energy and save millions of birds each year.